The game is on and I actually didn’t go to the gym during it. I’ll watch most, if not all of it and then head to the gym. Go Packers! 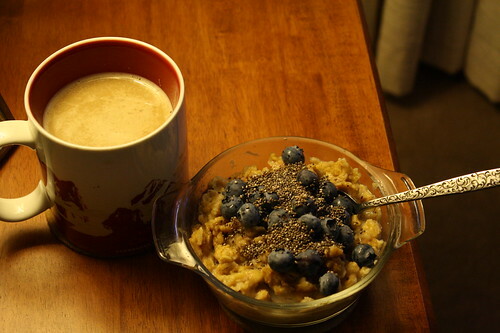 I started my day with a bowl of oats topped with fresh blueberries and chia seeds. I used my China Starbucks cup because I needed a huge cup of coffee. The cats woke us up at 6:15 and I couldn’t sleep anyway, so I got up. I figured it was better that way for waking up at 5:40 tomorrow. 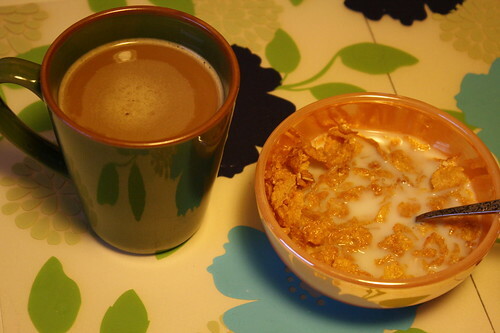 Later in the morning, I snacked on Jessica’s granola and had another cup of coffee. 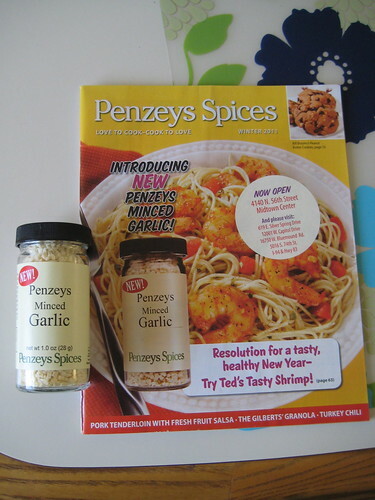 I headed out of the house to run some errands to Sears, Penzey’s Spices and Sendik’s grocery store. 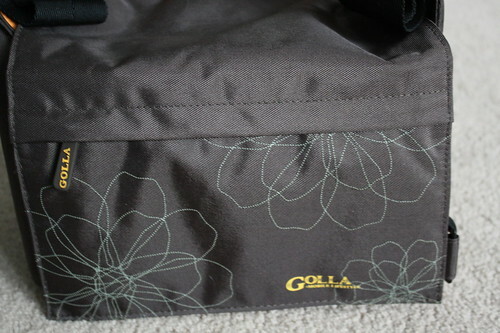 At Sears, I got the Golla Lynne camera bag I wanted before our trip to Florida! 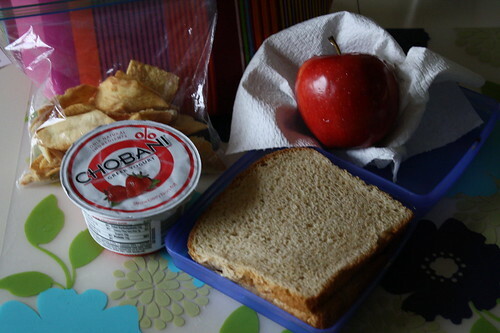 Before leaving the house, I used the Sears 2 go shopping site on my iPod touch & loaded the page showing the Sears associated CSN linked site for the Golla Lynne camera bag. They had a sale on the bag for $41.99 and Sears itself did not. I asked for the price match and got it. Sweet! The bag was “free” anyway because I got a Sears gift card from my credit card points. Here is the back of the bag, where a small pocket is. Here is a somewhat fuzzy picture of the interior color and style. 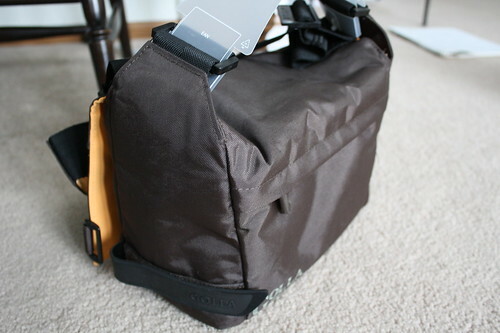 It is roomy enough to hold a DSLR camera and a lens (someday we’ll buy the big lens, I hope). I like how the bag sits on my hip and doesn’t feel heavy. I think I will end up using it as a camera bag and purse on our trip. 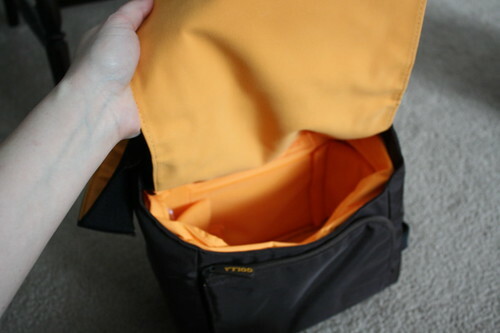 The front pocket has more than enough room for my purse items, as long as I stay minimalistic. At Penzey’s Spices, I got this nice 1 oz. jar of minced garlic for free. Thanks to their catalog coupons, I have built up a nice collection of spices and most of them were free. If you don’t already get their catalog in the mail, I would encourage anyone to sign up for it to get the free spices and excellent recipes inside. You don’t have to purchase anything to get the free spices either, so that’s an added bonus. The quality of their spices is excellent. 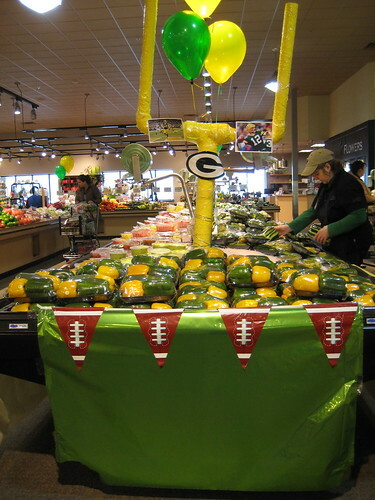 At Sendik’s grocery store, I found this very green and gold display, so I couldn’t resist taking a picture. Those are green and yellow peppers packaged together. 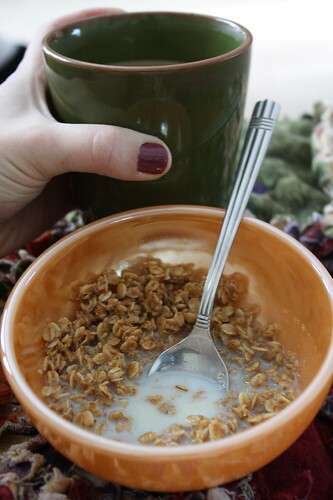 Once home, I used some of the spinach I just bought to make a green monster smoothie. I put Silk almond milk, Whole Foods soy protein powder, a half of a frozen banana, some frozen pineapple and ice cubes in it. I didn’t realize it until I was taking these pictures–maybe the green smoothie with yellow pineapple will be good luck for the Packers! His and hers smoothies. I always have the large size. 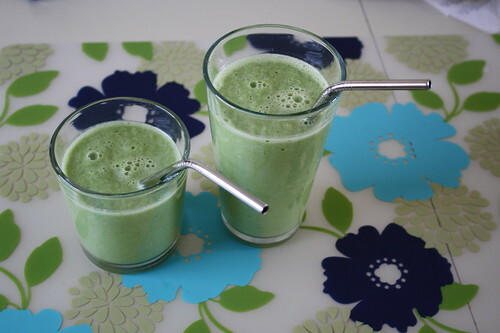 My husband doesn’t eat spinach in salads or on sandwiches, but I can get him to drink it in this smoothie. 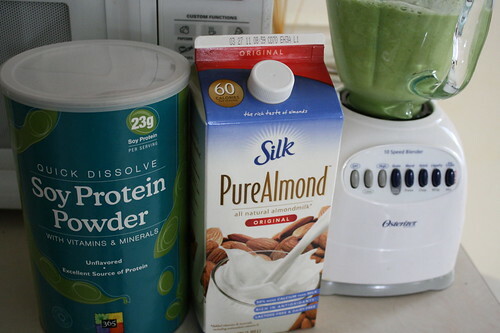 I have found through all of my green monster experimentation–I prefer the flavor of plain almond milk in the smoothie vs. skim cow’s milk. 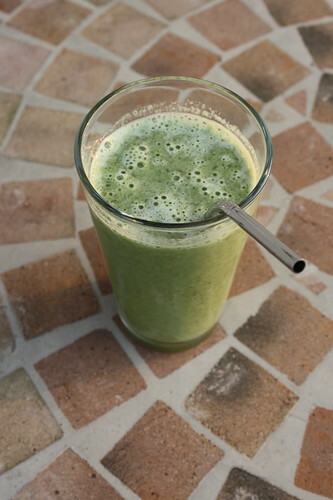 I don’t think I have ever posted a green monster smoothie on here before. I always make them in the summer, but it’s hard to drink cold smoothies during the winter. 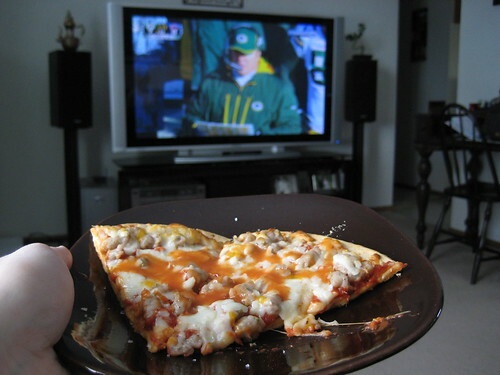 And I realize this post is getting very long, so I will end it with a picture of the pizza I ate while watching the beginning of the Packers vs. Bears game. Later on, I’ll go to the gym for some elliptical, biking and weights. The Pack is in the lead at 14-0 right now, so let’s hope we win the game! If you read my blog, you know I am not a huge football fan and neither is my husband. But, for the sake of my home state’s very dedicated football fans, I hope we win.